Most of the honey found in the supermarket is not raw honey but “commercial” regular honey, which has been pasteurized (heated at 70 degrees Celsius or more, followed by rapid cooling) and filtered so that it looks cleaner and smoother, more appealing on the shelf, and easier to handle and package. Pasteurization kills any yeast cell in the honey and prevents fermentation. It also slows down the speed of crystallization in liquid honey. On the downside, when honey is heated, its delicate aromas, yeast and enzymes which are responsible for activating vitamins and minerals in the body system are partially destroyed. Hence, raw honey is assumed to be more nutritious than honey that has undergone heat treatment. Most processed honey today has been heated and filtered, robbing it of its nutritional value and resulting in a product no more valuable than a simple sweetener. Honey is an instant energy-building food containing all the essential minerals necessary for life, all of the B complex group, amino acids, enzymes, and other vital factors. Honey is virtually free of bacteria and rarely spoils. Much of raw, unfiltered honey’s effectiveness and health benefits may be due to the presence of Bee Pollen and Propolis, but there are substances in honey as yet unidentified, that may be responsible for its positive effects. Honey has been used since ancient times both as a food and as a medicine. Apiculture, the practice of beekeeping to produce honey, dates back to at least 700 BC. For many centuries, honey was regarded as sacred due to its wonderfully sweet properties as well as its rarity. It was used mainly in religious ceremonies to pay tribute to the gods, as well as to embalm the deceased. Honey was also used for a variety of medicinal and cosmetic purposes. For a long time in history, its use in cooking was reserved only for the wealthy since it was so expensive that only they could afford it. The prestige of honey continued for millennia until one fateful event in culinary and world history – the “discovery” of refined sugar made from sugar cane or sugar beets., Once these became more widely available, they were in great demand since they provided a relatively inexpensive form of sweetening. With their growing popularity, honey became displaced by sugar for culinary use. Since then, although honey is still used for sweetening, much of its use has become focused on its medicinal properties and its use in confectionary. Unlike honey, table sugar lacks minerals and vitamins (hence it’s been often called empty calories), they draw upon the body’s nutrients to be metabolized into the system. When these nutrients are all used up, metabolizing of undesirable cholesterol and fatty acid is impeded, contributing to higher cholesterol and promoting obesity due to higher fatty acid on the organs and tissues. Honey contains antioxidants, a wide array of vitamins, minerals and amino acids. Heals wounds, burns, cataracts, skin ulcers, sores and scrapes. It’s amino acids and vitamin C speed the growth of healthy tissue. It’s a natural source of energy. It enlivens the body, makes muscles stronger, refreshes nerves, cheers up, sharpens the mind, and gives sound sleep. Bee Pollen contained in raw honey contains 22 amino acids, 27 minerals and a spectrum of vitamins. Raw honey contains over 5000 enzymes including amylase, a digestive enzyme for carbohydrates. The benefit of ingesting naturally occurring enzymes such as amylase is that it reduces the burden on the body to produce these enzymes itself to digest the food. Raw honey has an exceptionally high concentration of enzymes and provides an outstanding source of energy for the body. Antioxidants, found in raw honey are compounds that provide natural defenses against cell damage by neutralizing unstable oxygen molecules known as free radicals. 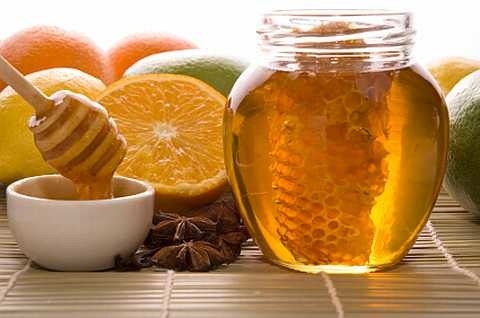 Antioxidant compounds in raw honey are believed to aid the body in fighting cancer and heart disease as well as a host of other degenerative diseases. Honey contains high antioxidant levels equivalent to that of spinach, or even strawberries, and unique to honey is pinocembrin, an antioxidant associated with improved brain functioning. For skin rashes, burns and abrasions. Apply a small amount of Raw Honey lightly over the affected area; may cover with a dressing or a dusting of cornstarch to reduce any stickiness. For a sore throat, mix 6 oz. liquid honey, 2 oz. glycerin with juice of 2 lemons. Bottle and cork firmly. Use as required. For blocked noses, Place a dessert spoon of honey in a basin of hot water and inhale fumes after covering your head with a towel over the basin. Raw honey that has not been pasteurized, clarified, or filtered – provided it is of the highest organic quality – is your best choice. Look for honey that states “100% pure.” While regular honey is translucent, creamy honey is usually opaque and is made by adding finely crystallized honey back into liquid honey. Specialty honeys, made from the nectar of different flowers, such as thyme and lavender, are also available. Remember that the darker the color, the deeper the flavor. It is important to keep honey stored in an airtight container so that it doesn’t absorb moisture from the air. Honey stored this way in a cool dry place will keep almost indefinitely. One reason for this is that its high sugar content and acidic pH help to inhibit microorganism growth. Honey that is kept at colder temperatures tends to thicken, while honey that is kept at higher temperatures has a tendency to darken and have an altered flavor. This is awesome, I’m taking diseases of the HUman Body and Pharmacology and learning a lot about natural healing. I grew up with raw natural honey given to me every day by my grand mother. And now that I am older i use honey all the time. I have very good health at my age near on 50 years. I recommend raw honey to every one that I know. But People now a days just want to pop a pill to make them feel better…what a shame..and all because of the pharmaceutical company’s and there profit making schemes. And then they wonder why they can not cope with the high % of people being sick all the time..the answer is in the natural foods that the Almighty put on this planet in the first place…!! !